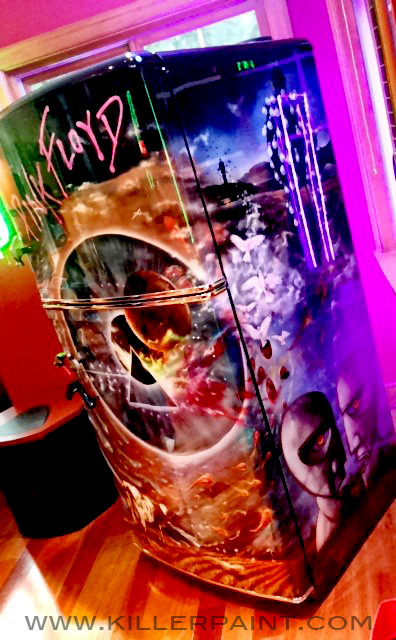 The customer, a huge fan of Pink Floyd, wanted this fridge done in a theme dedicated to his favorite band. 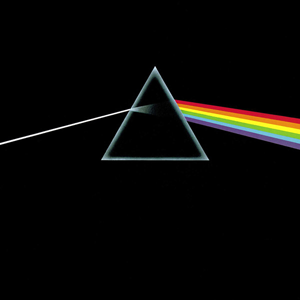 Artwork from a number of different ‘Floyd album covers and other sources from the group’s long history. Plus, there are a few other fun changes made to this project. 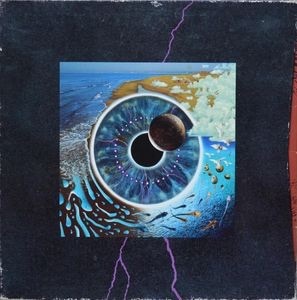 The image on the front door features a large central piece that is an amalgamation of the cover artwork from the albums Pulse and Dark Side of the Moon. An additional feature on the door that is more than just paint is the handle. 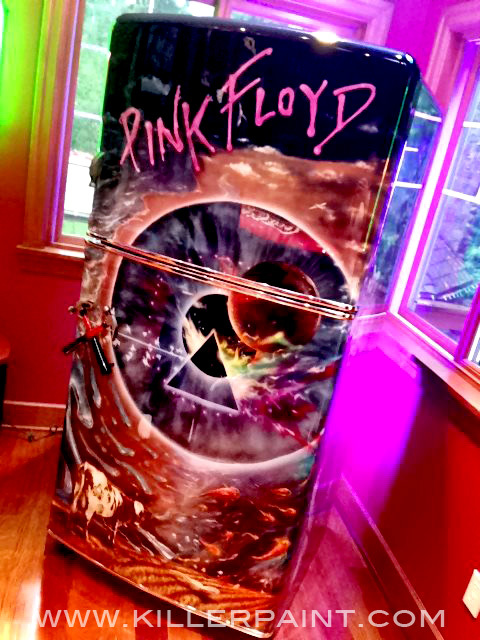 The refrigerator’s original has been removed and replaced with a custom one, in order to continue the Pink Floyd theme even further. The new handle is made from two actual metal hammers. They were cut, fitted and welded together, then painted to look like the iconic marching hammers shown during the “Waiting for the Worms” song segment of Pink Floyd’s 1982 film version of “The Wall”. The new handle piece was bolted to the door using metal mounting pegs welded to the back of the hammers, ensuring that the attachment will be sturdy enough to hold up to continued usage for a long time to come. It is definitely quite a bit less ergonomic than the handle the fridge came with, but you could probably open bottles using this one if you wanted to. It is the cow from the cover of the ‘Floyd album “Atom Heart Mother.” Well, almost the same cow. 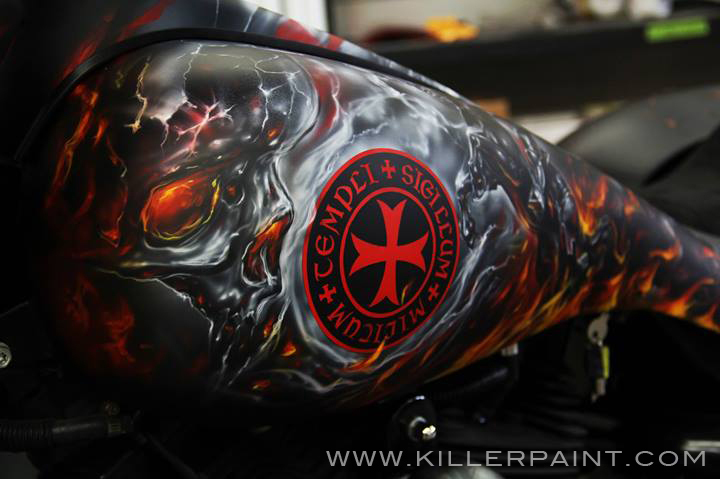 If you take a closer look, you will notice that some of the cow’s markings have been modified slightly in order to resemble the spade and skull used in the Killer Paint logo. 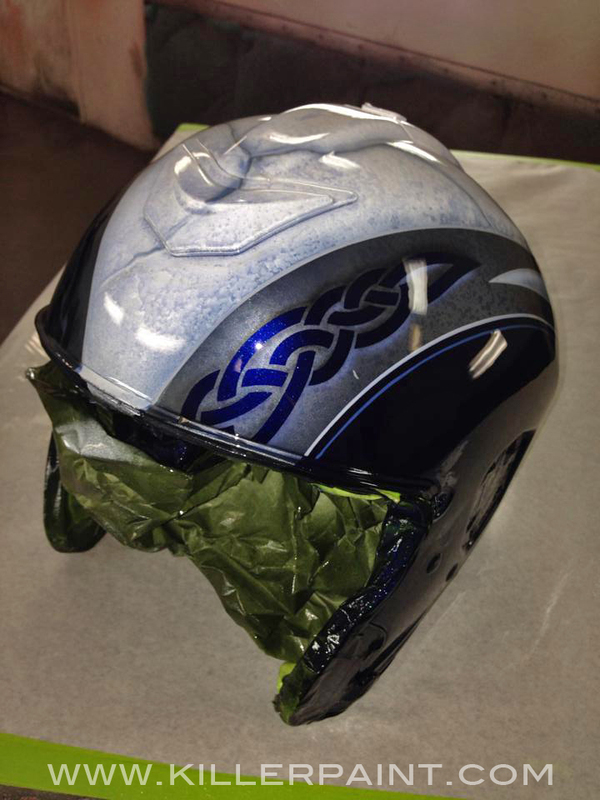 Almost every job that comes out of the shop gets a Killer Paint logo painted on it somewhere. It is just not always as subtly placed as this one. The artwork on each side of the refrigerator is designed to transition from one image to the next. The elements from the designs on the door flow over and morph around the corner and onto the right hand side. 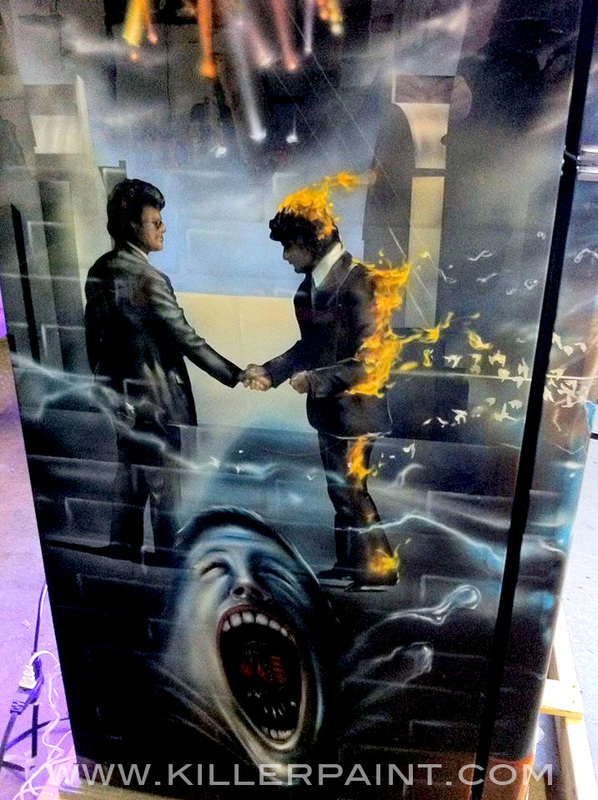 On this piece, the stone heads from the cover of the Pink Floyd album “The Division Bell” sit on the ground at the bottom of the fridge. 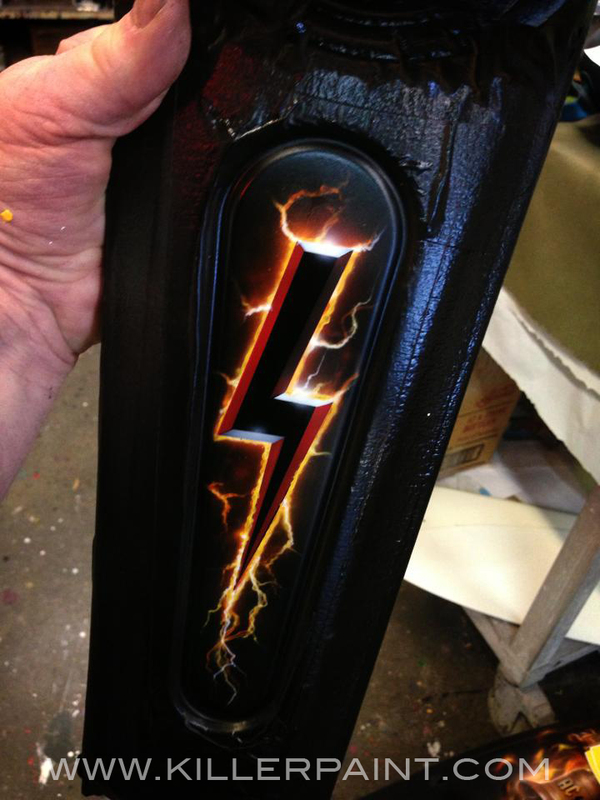 Above them, artwork derived from the cover of the live double album “Delicate Sound of Thunder” occupies the top half. 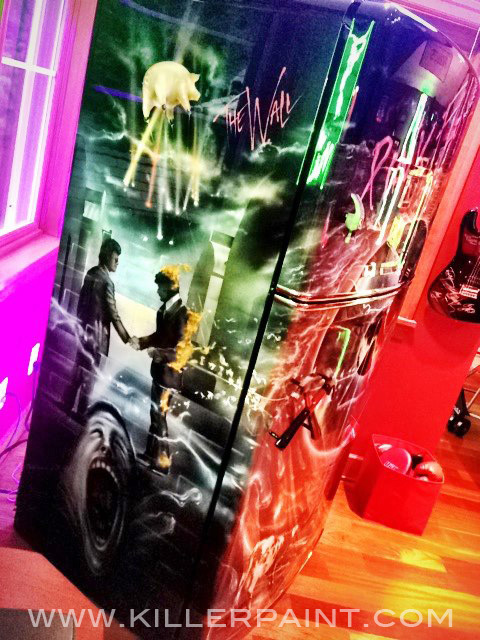 On the opposite side of the refrigerator, the image from the cover of the “Wish You Were Here” album is the central piece. At the bottom sits the screaming face associated with “The Wall,” while a transparent brick pattern runs up the side over the other artwork. 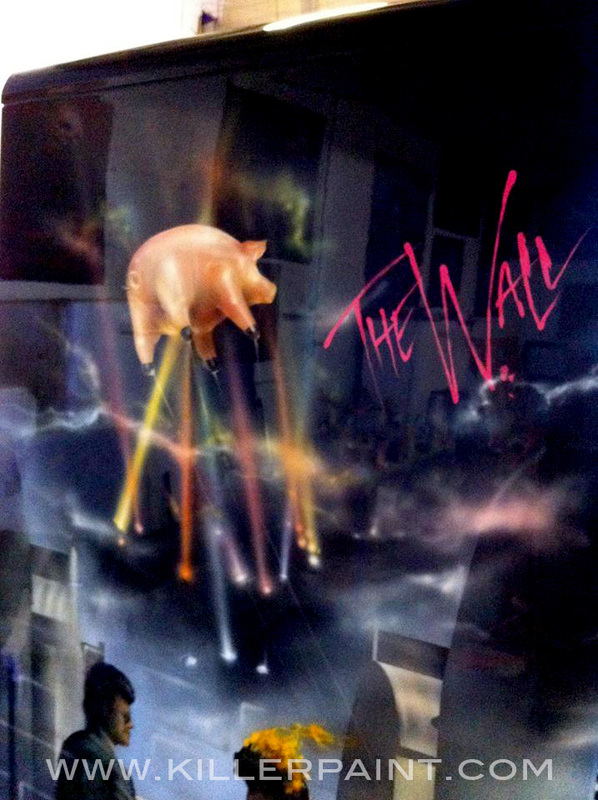 The logo for “The Wall” sits at the top in the dark sky, where the iconic flying pig, floats across the sky, lit by an array of multi-colored spotlights. 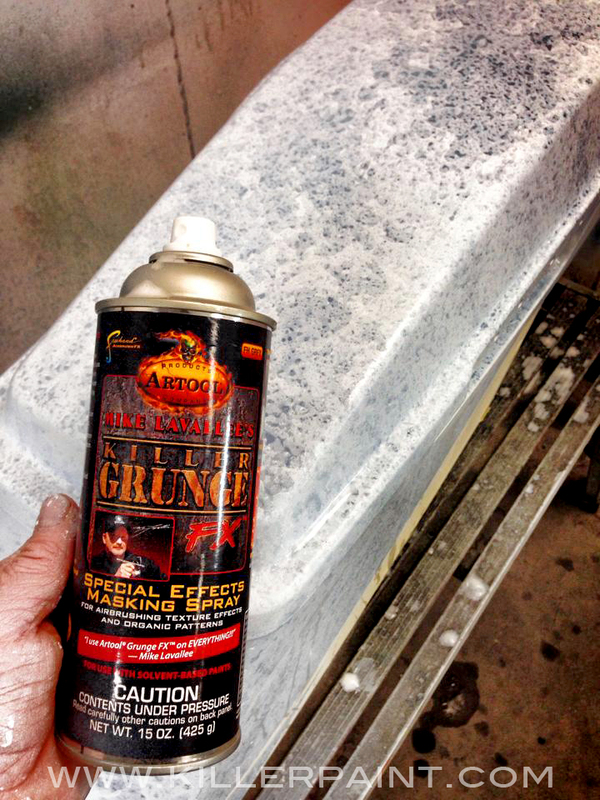 Most refrigerators painted at Killer Paint are destined for home theaters, game rooms or “man caves” and not a typical kitchen. This one was no exception, so as with many custom fridges, neon was added to the back, to add that extra ambiance in its final setting. In this case, what better color than pink? Completed just before Thanksgiving, the refrigerator was loaded up and driven to the customer’s home, to make sure it was in place before the madness of the holiday season started. The room the refrigerator was to be in was full of other valuable keepsakes and memorabilia, and up a narrow outdoor stairway, so getting it into place was no simple task. 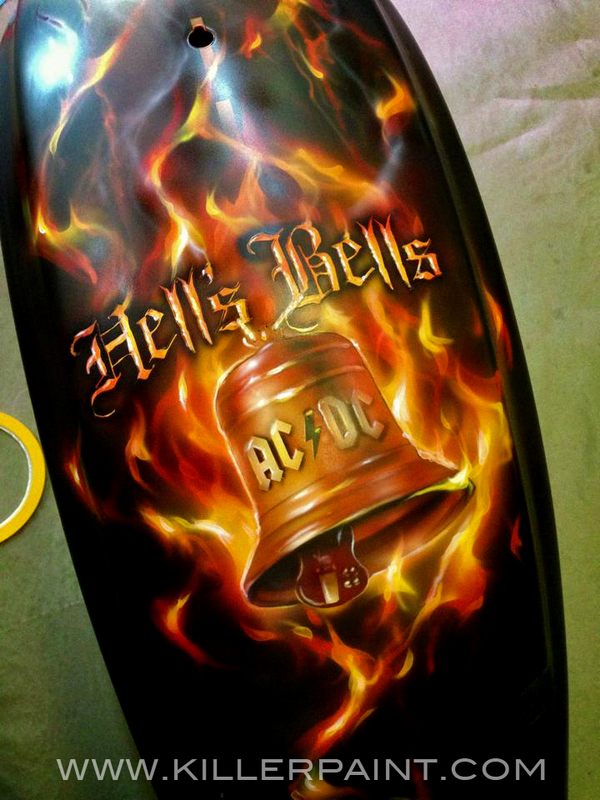 This bike was going to be fender-to-fender AC/DC. 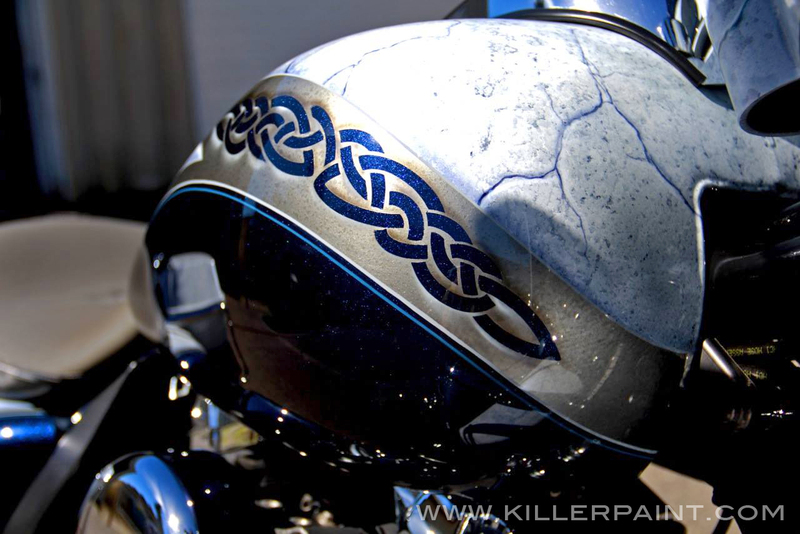 The owner of the bike had a bunch of favorite images from the bands albums and history that he wanted to incorporate into the design on this project, so basically every section on the motorcycle has its own piece of artwork, and some parts even have more. 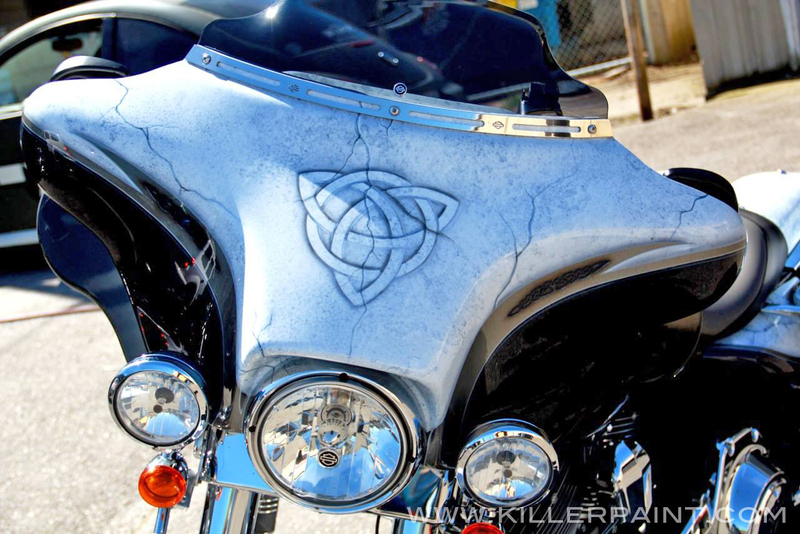 This Harley’s fairing features a “Rock N’ Roll Train,” from the band’s song of the same name. 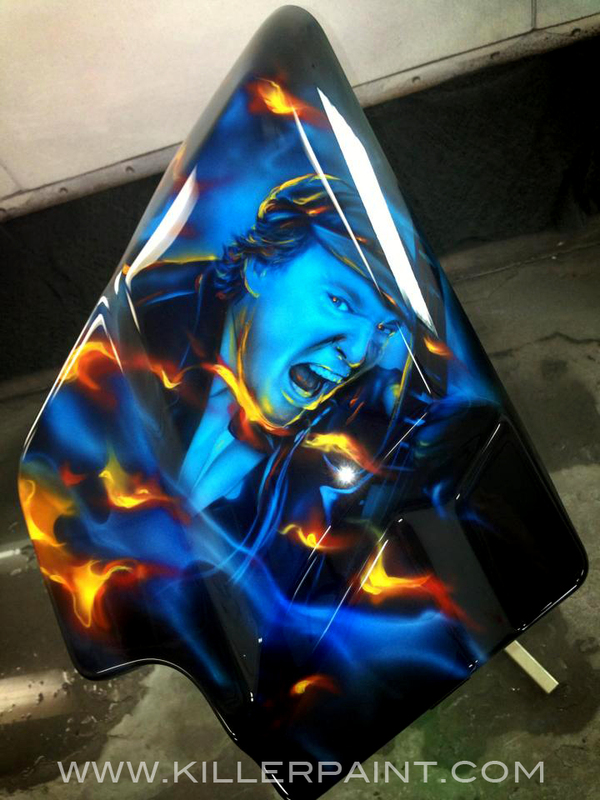 An image of AC/DC guitarist Angus Young on a motorcycle appears on the front fender, with both parts sharing the same stormy, thunderstruck sky. 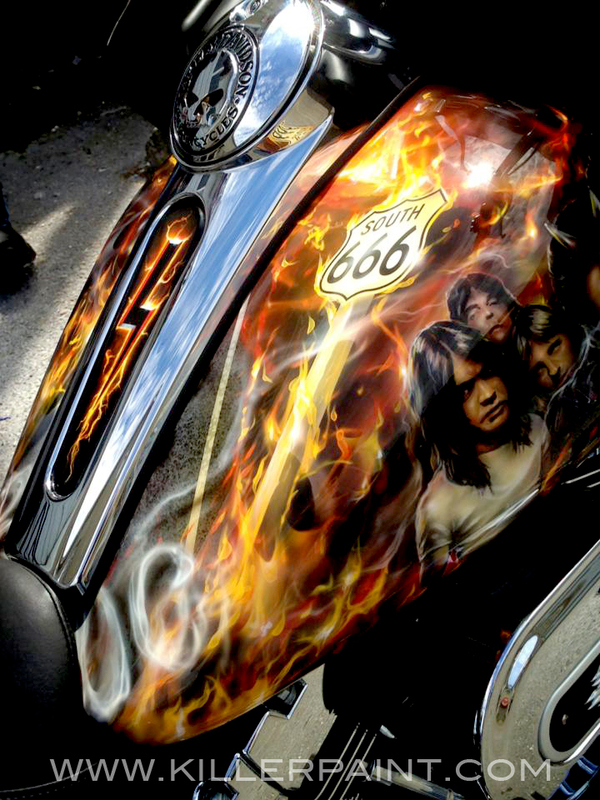 For the top of the tank, Mike painted a literal “Highway to Hell,” using his Killer Grunge FX spray to add texture to the pavement. The road is engulfed in flames all the way to the burning horizon. Smoke issuing up from the bottom forms the letters “AC DC,” and a highway sign marking the damned route completes the scene. 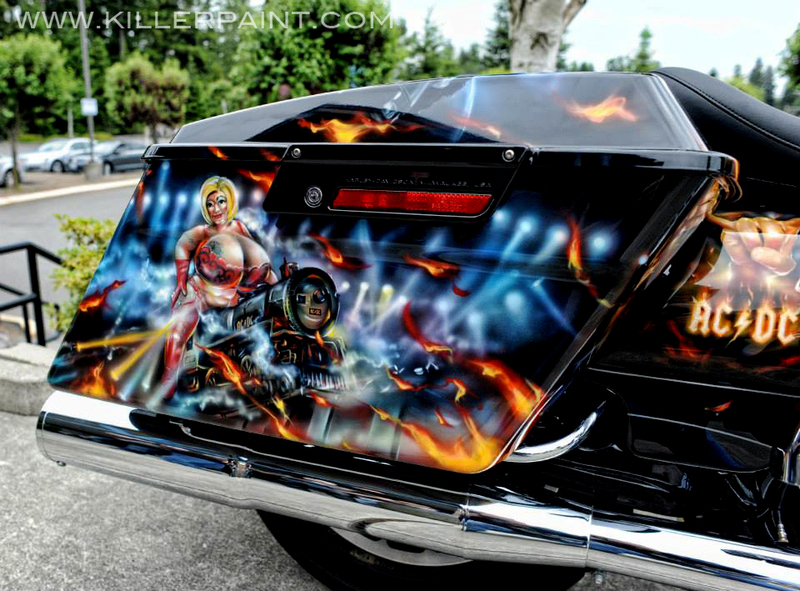 Each side of the gas tank received its own separate artwork. One side has another “Rock N Roll Train,” while the other side has an image of the band from the cover of the “Highway to Hell” album, right below the burning highway sign. 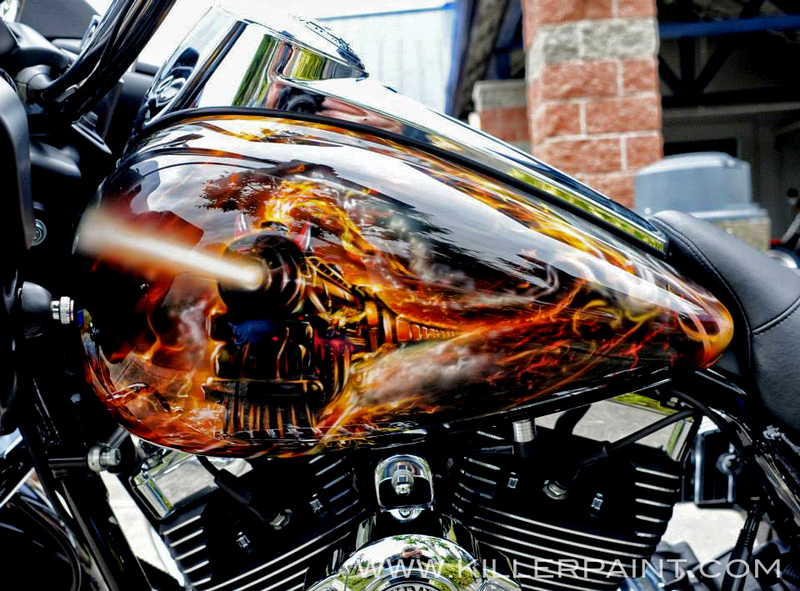 Additional flames tie the images from the top and sides of the tank into a single flowing piece. 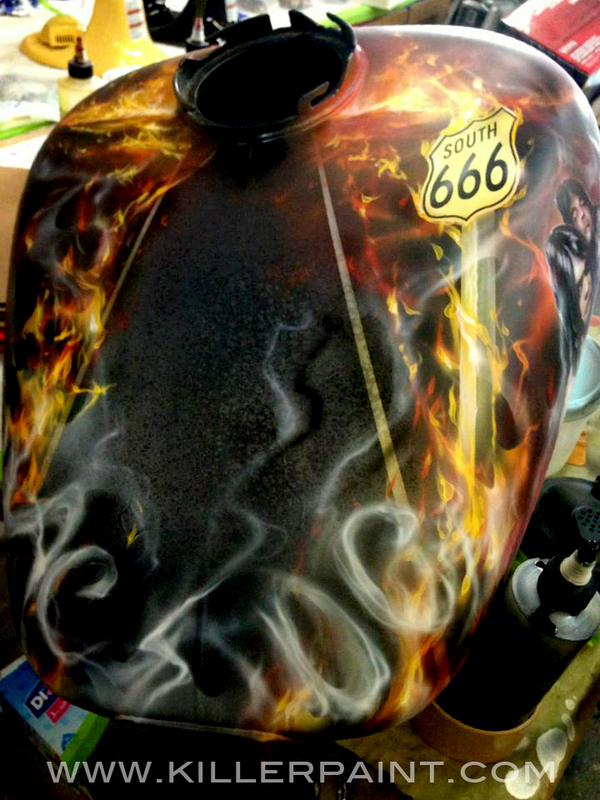 Behind the seat, the “Highway” continues on through the rear fender, ending with a flame engulfed “Hell’s Bells” emblem. The side of each saddle bag also received its own artwork, of course. The right hand bag (as the driver sits) shows a concert scene with a “Whole Lotta Rosie” astride the train. 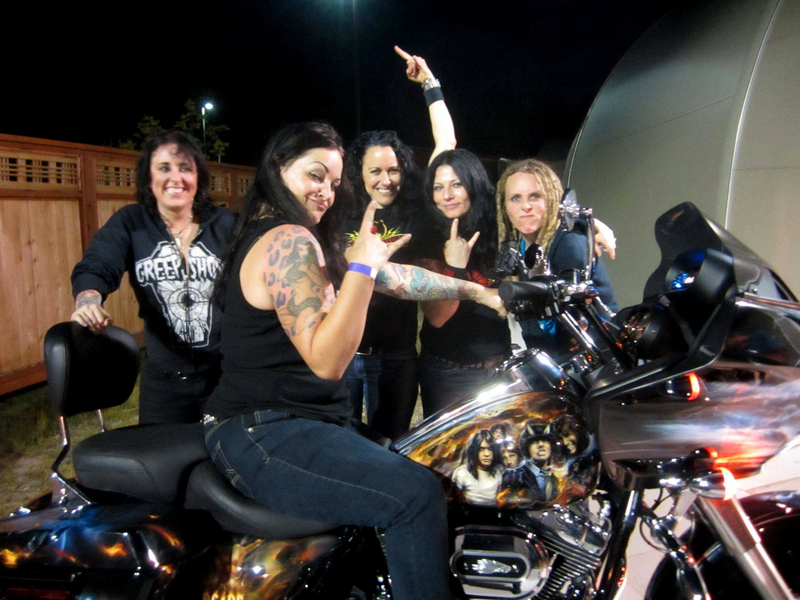 The bike showed up at a concert by the all-female AC/DC cover band “Hell’s Belles.” The ladies in the band seemed to appreciate this Harley, too. 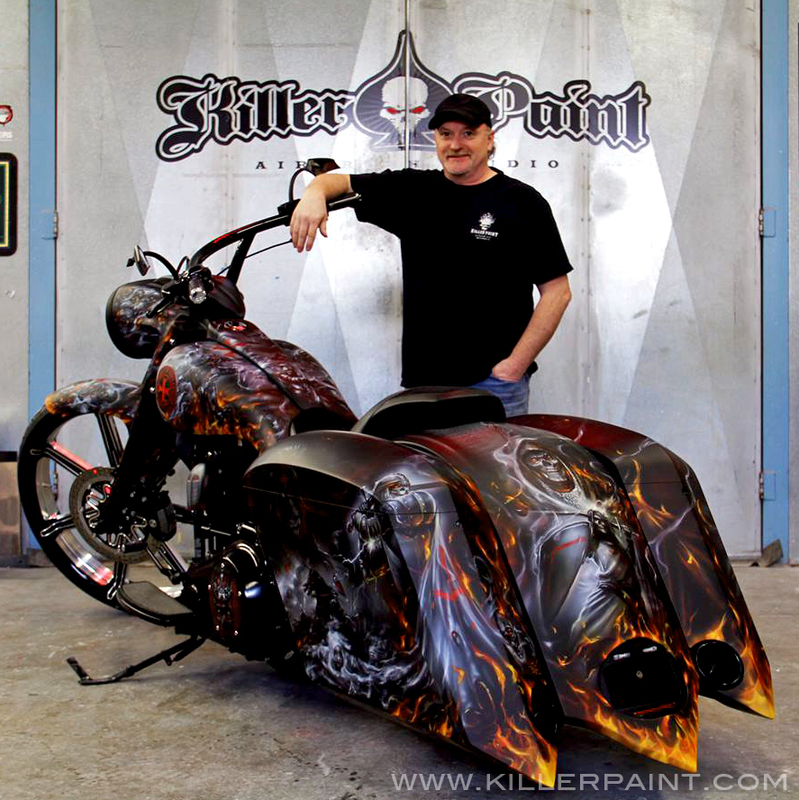 In 2014 we had a very interesting bike come into Killer Paint. 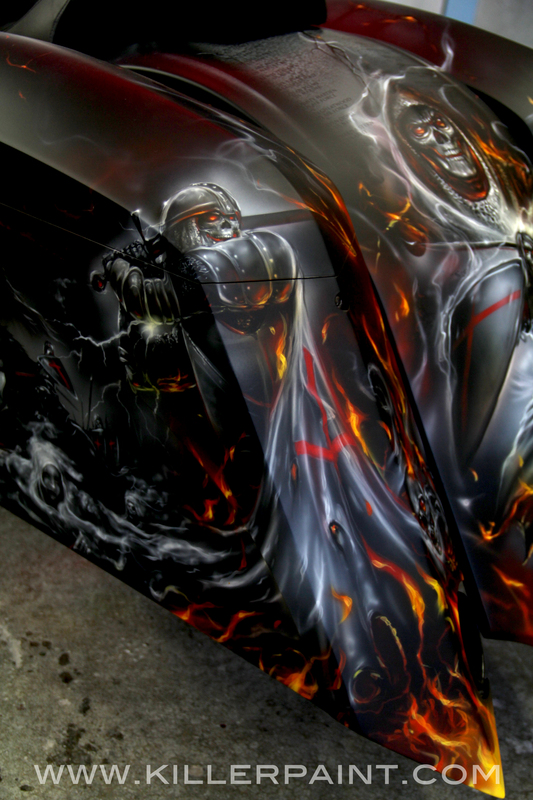 In addition, the owner wanted to have a pretty extensive artwork theme done on it. 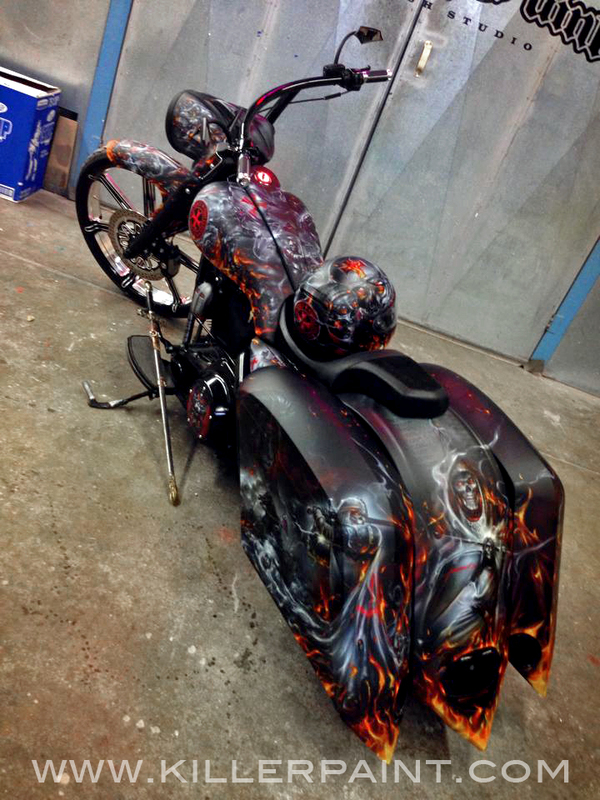 The bike came into the shop already completely black. 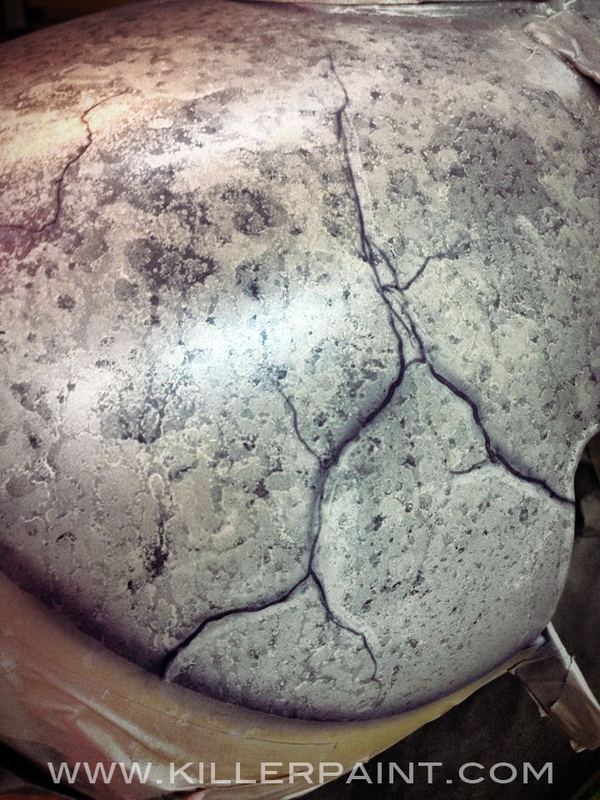 So there was no paint re-basing needed on this project, which always makes things much easier. 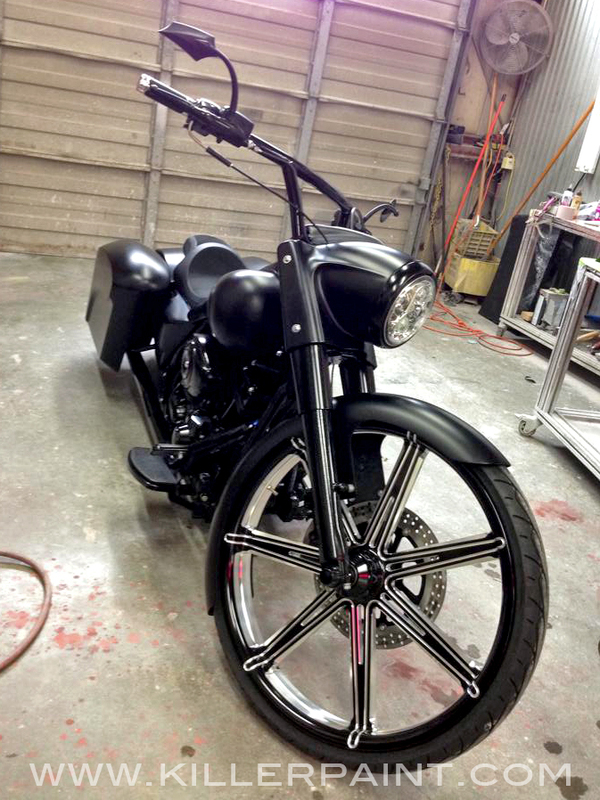 This ride also sports a sizable 26″ front wheel. 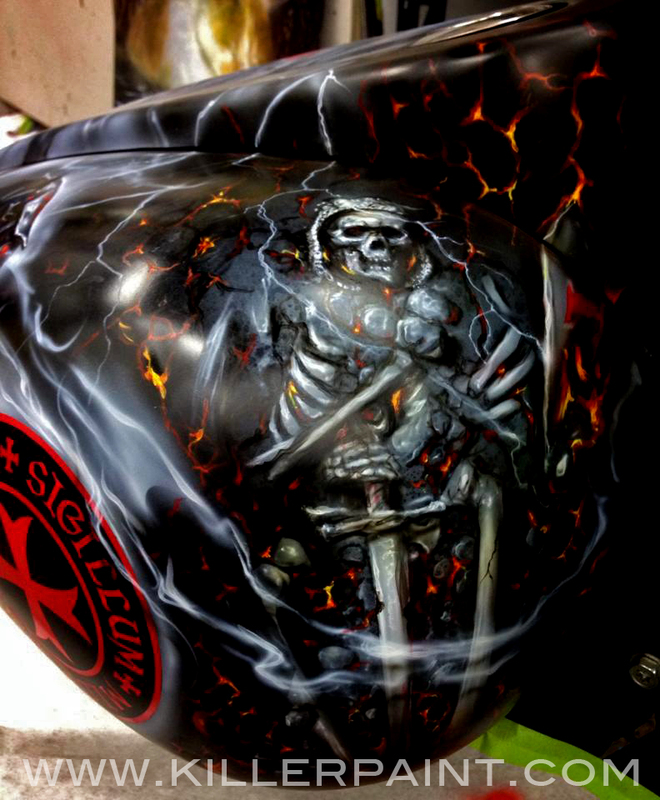 The customer wanted to pay tribute to military servicemen, and depict skeletal, eternal warriors from the Order of the Knights Templar in the fires of battle. 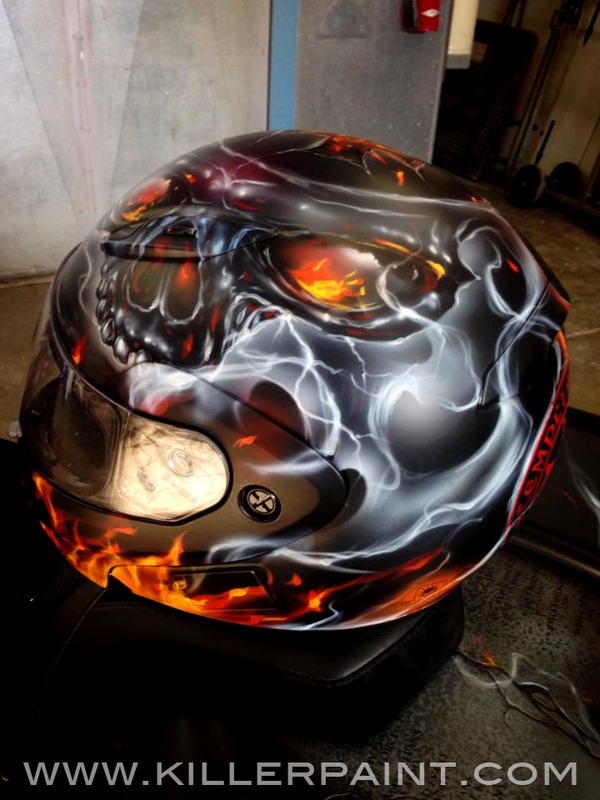 Skulls and fire? Definitely something Mike Lavallee has some experience with. The color scheme for the artwork has a monochromatic foundation. 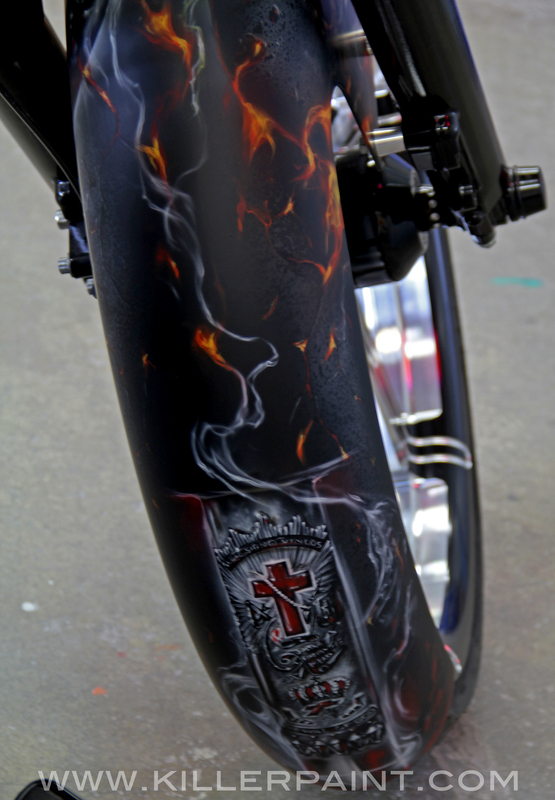 The added flashes of red used for all of the knight’s cross emblems help them stand out in stark contrast, and all of the True Fire™ on this project is in full luminous color as well. 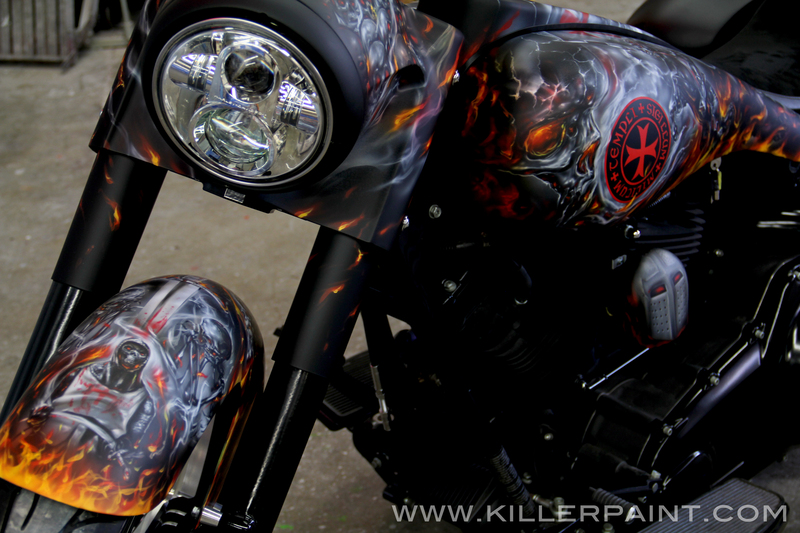 The headlight ring was left black, and the rest of the assembly was embellished with skulls and flames. 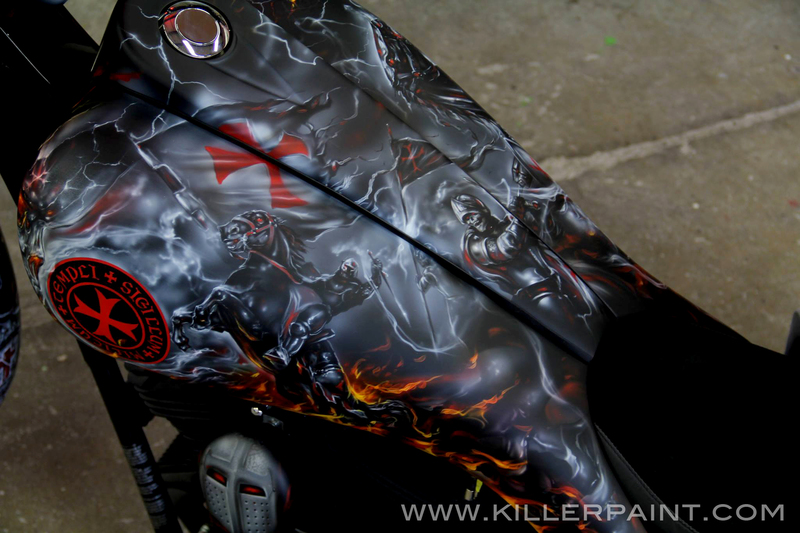 Each side of the tank sports the seal of the Knights Templar in bright red, to stand out as much as possible among the multitude of other imagery. 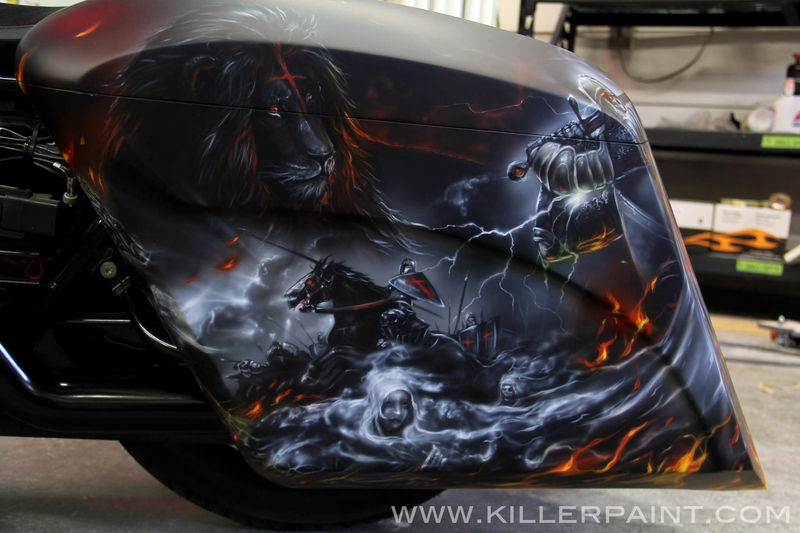 Skulls and wispy mists swirl around and about the various pieces of imagery. 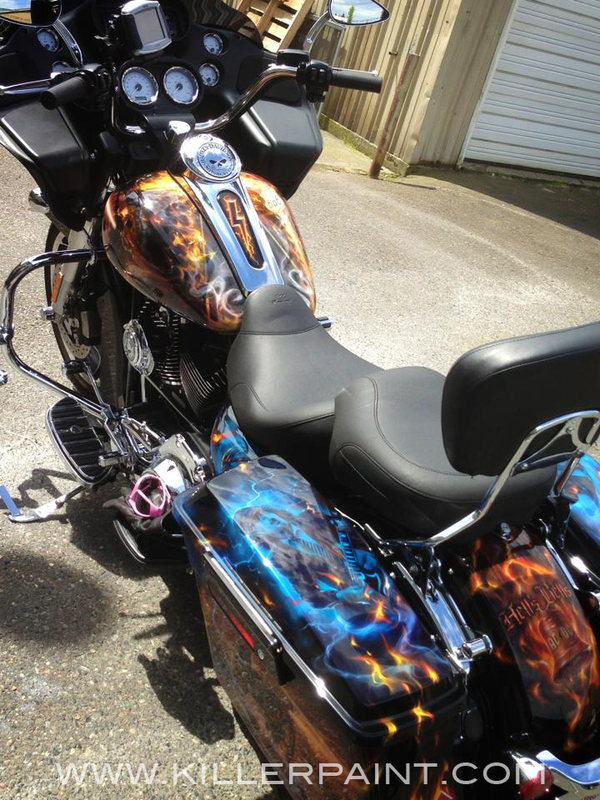 The saddle bags on this bike also have a lot of real estate for artwork, so rather than fill it with an awkwardly large single element, there is instead a collage of imagery more in proportion the the artwork on the rest of the bike. 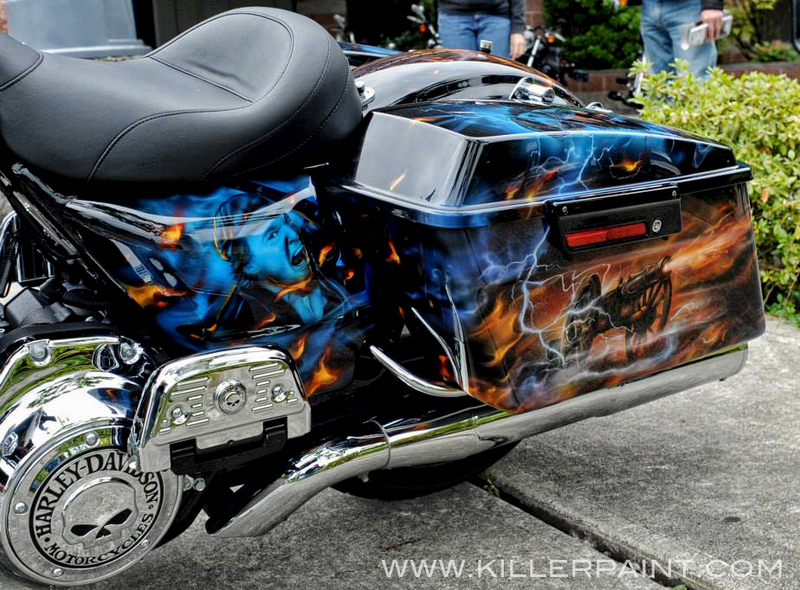 The saddle bag on the other side also features a composite mural. 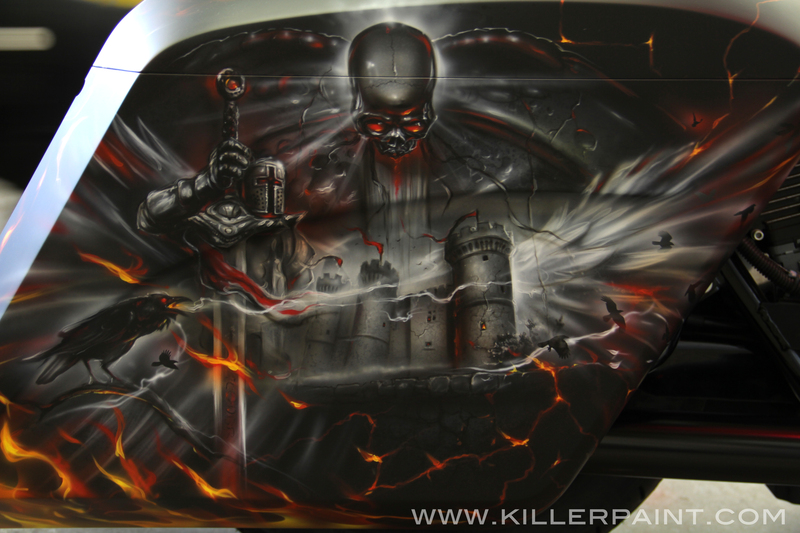 A castle is the centerpiece of the scene, and a knight, ravens and skulls are also depicted. 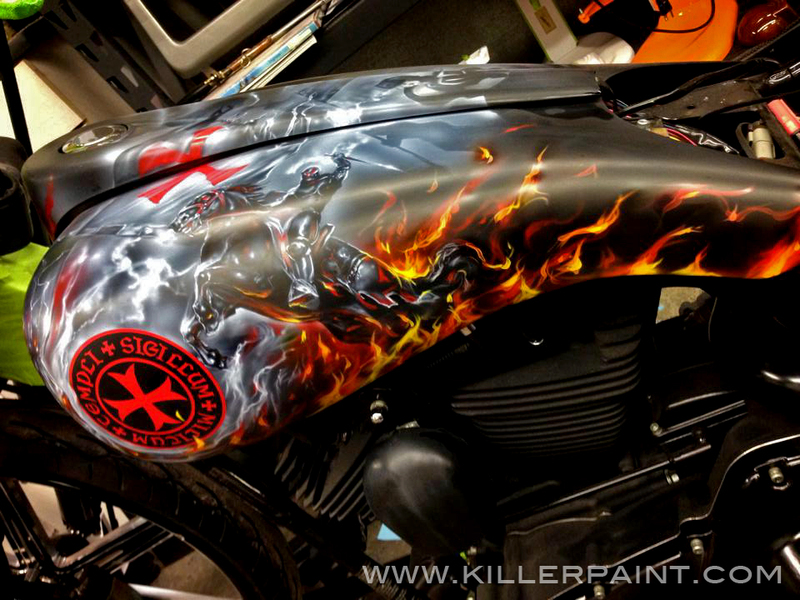 The rear fender features a much larger scale image of a skeletal Templar Knight, wreathed in smoke and flame. 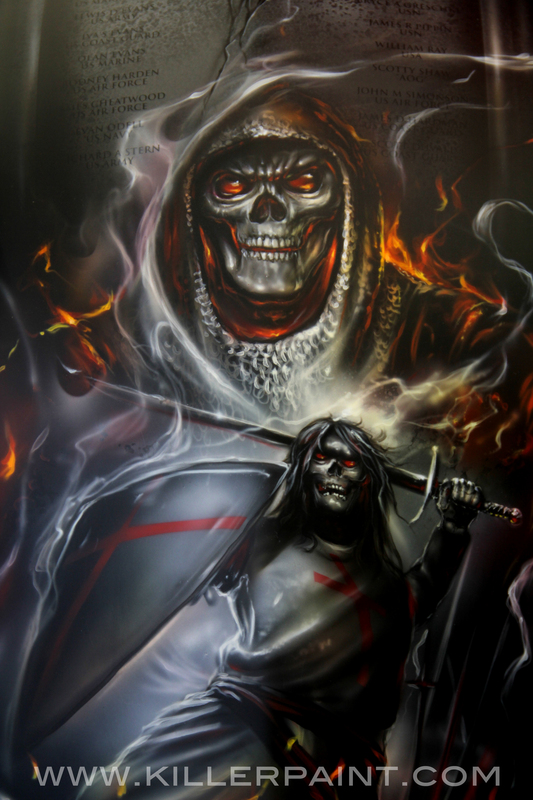 Another skull-faced knight is superimposed in front, swinging his sword with a raised shield. 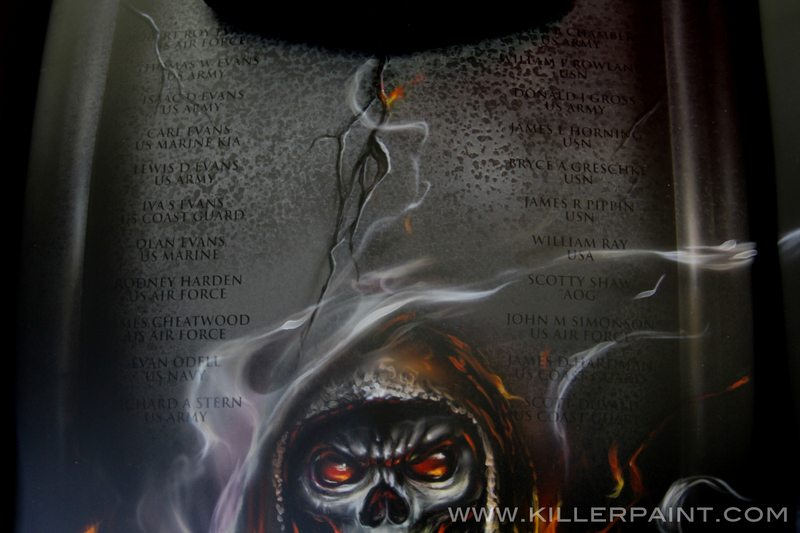 Painted above the eternal knight on the rear fender is a cracked stone tablet depicting a list of names, requested by the customer, of United States servicemen along with the military branches they each served in. 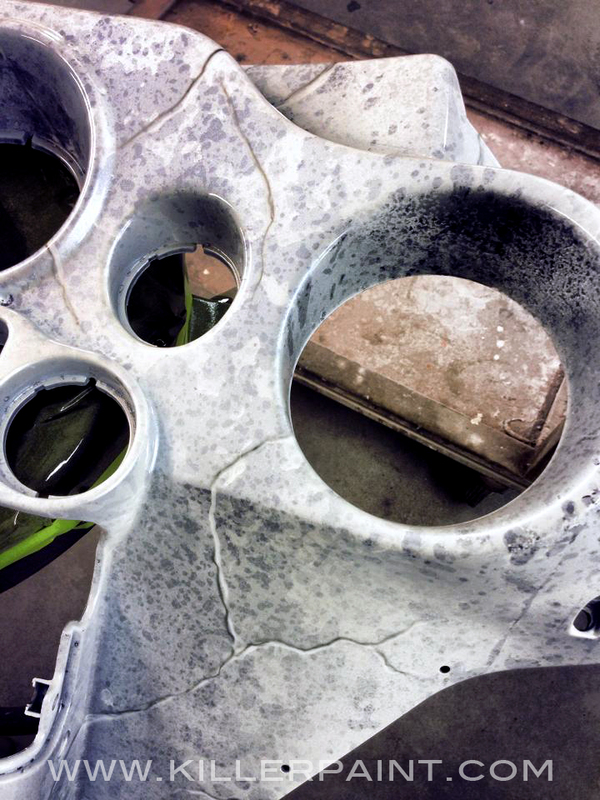 The bike was given a final clear coat in matte finish. It is something a trade-off- you don’t get the nice show shine that many people prefer, but in this case, less shine means fewer reflections and glare to interfere with the visibility of the artwork. It allows the darker shades to push into the background better, while the artwork, especially the color splash elements, can take center stage. 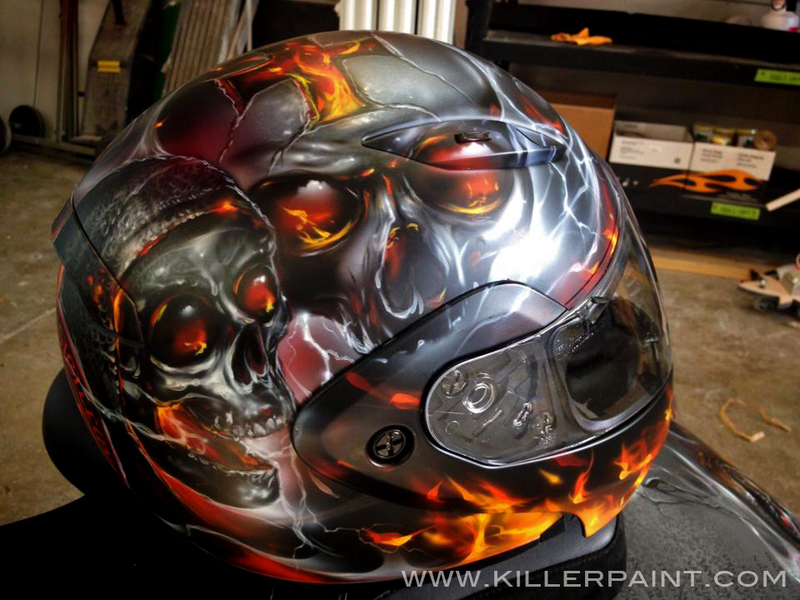 The helmet to accompany this bike is no less elaborately painted. 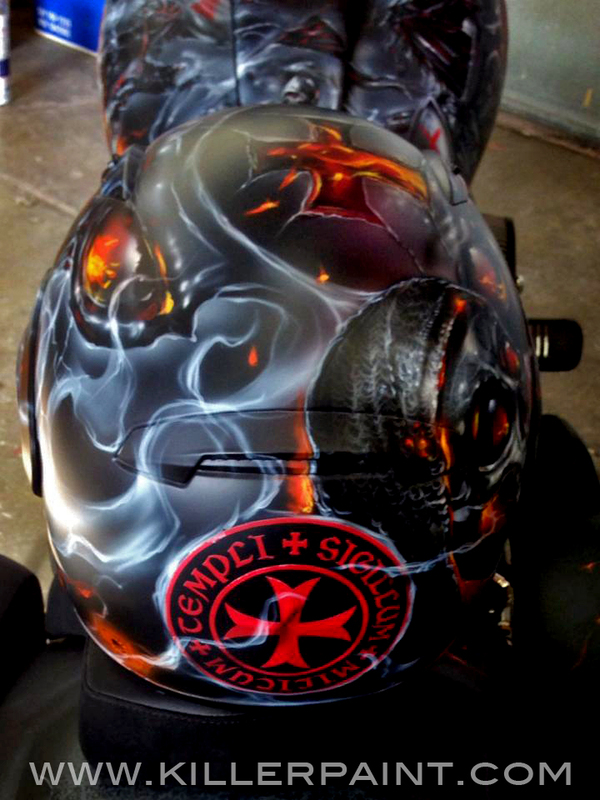 The Templar seal is repeated on the back of the helmet, again in bright red. 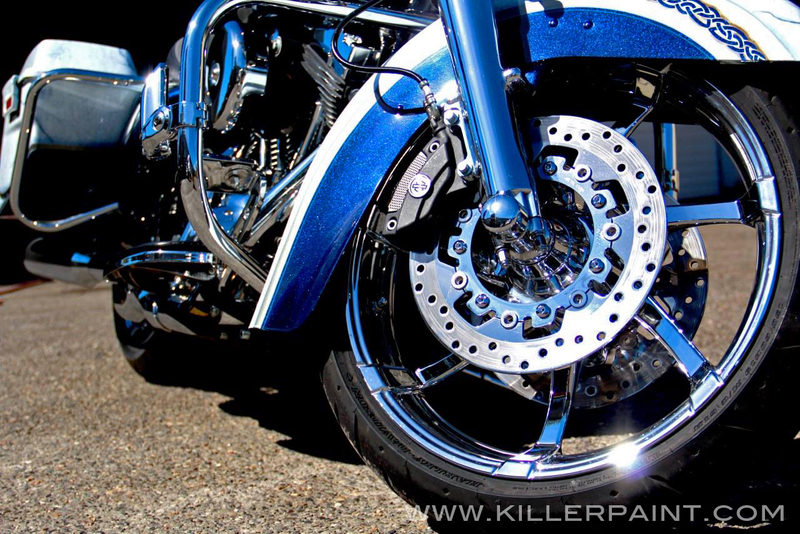 Most of the jobs that come to Killer Paint are for people’s personal cars, trucks, motorcycles and so on. 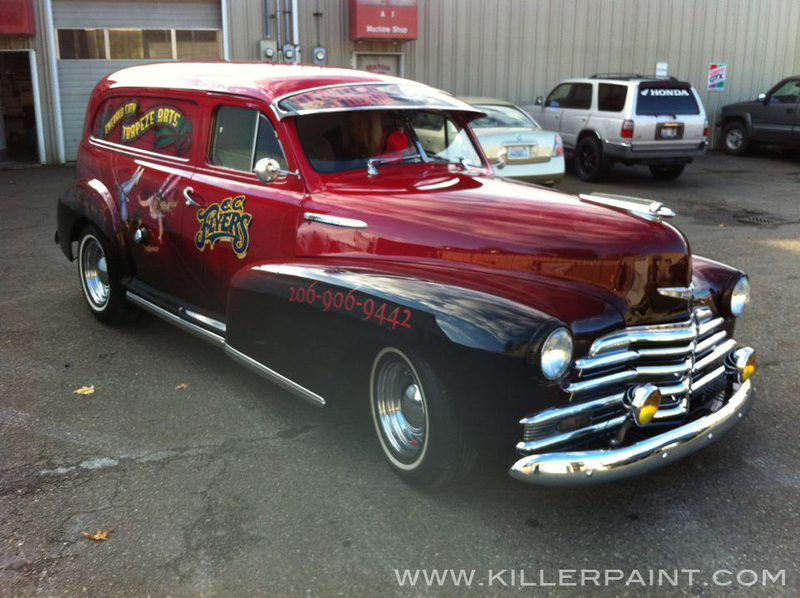 However, businesses also bring us vehicles for custom paint as well. 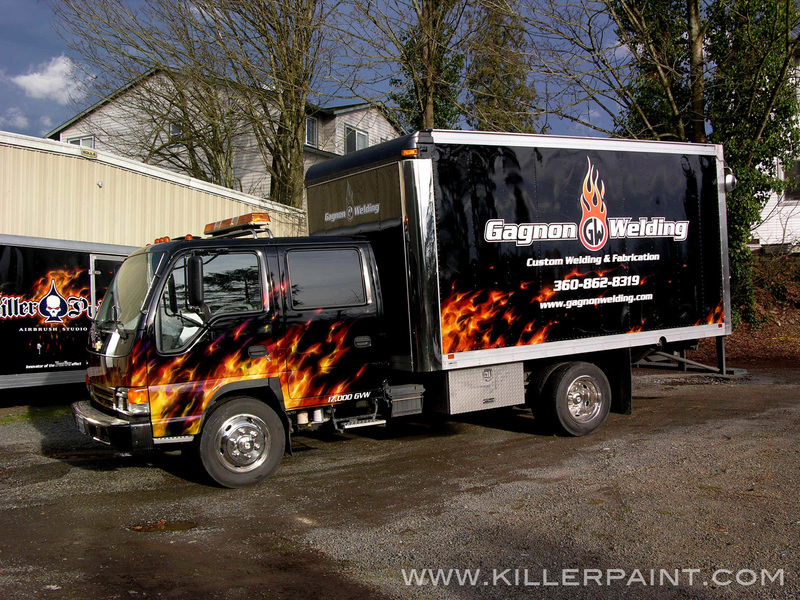 While there are cheaper signage/display options for vehicles, there are benefits to having paint on a company vehicle. 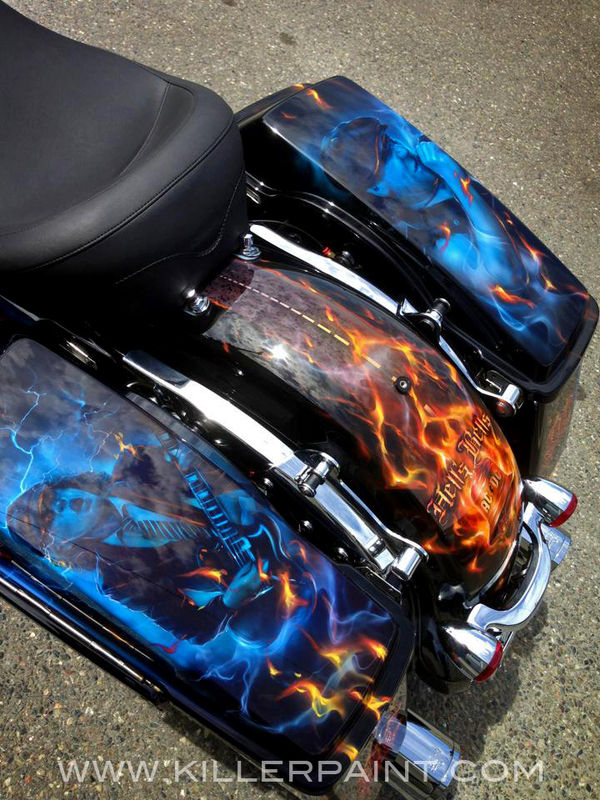 Custom painted artwork is highly useful where standout visibility for the company is desired. 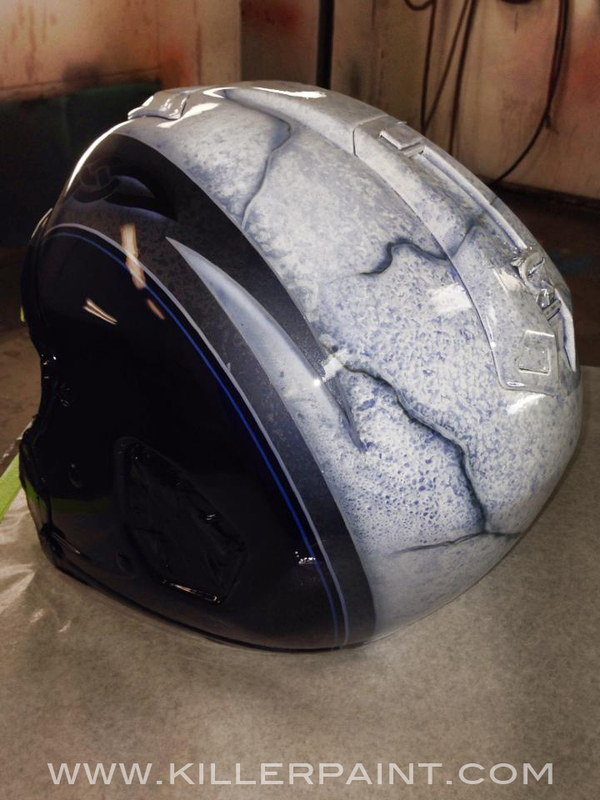 A nicely done vehicle will be a real head-turner as well. Many companies take advantage of that kind of attention draw to make sure that their business is seen. 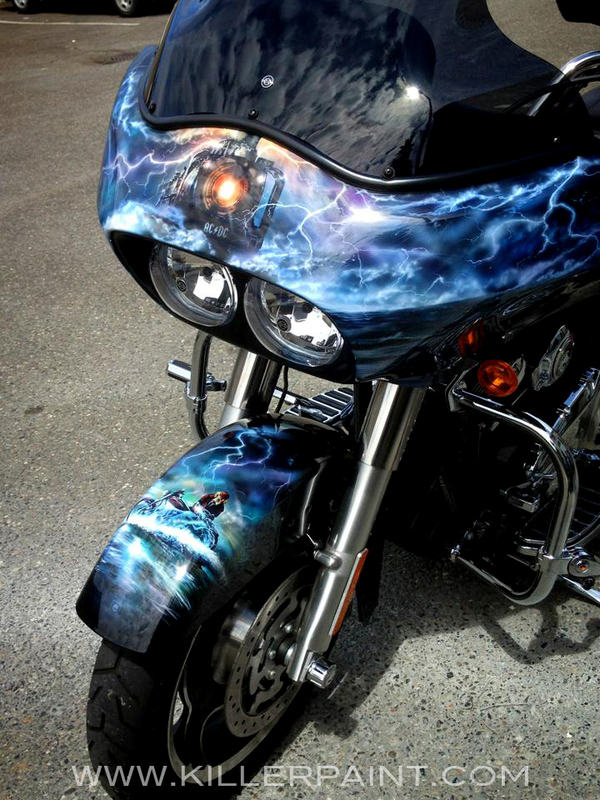 With a really knockout paint job, you are not only seen, but remembered. 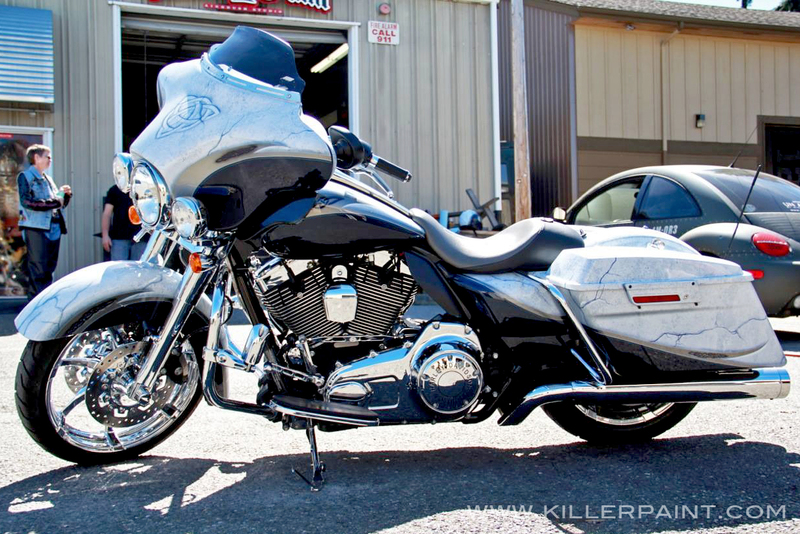 Some companies chose to invest in a special car, truck or motorcycle to use as a show vehicle. 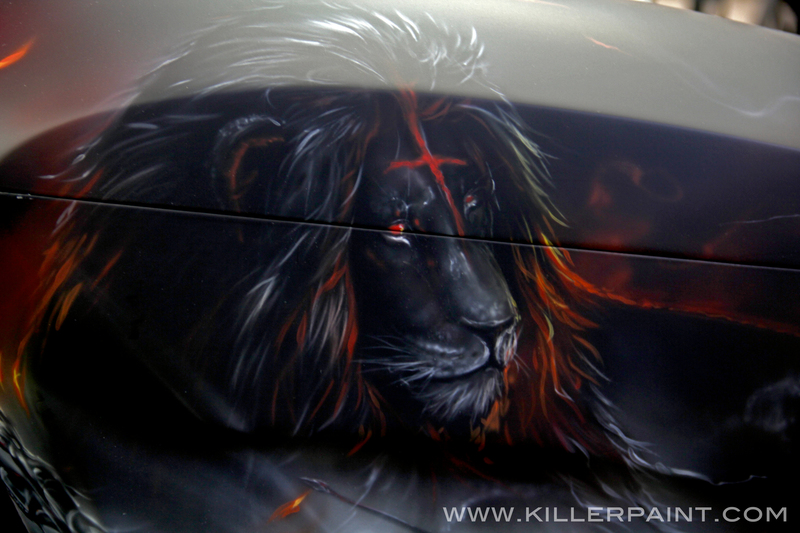 Custom artwork is often highly desired for a business show car, because the first thing a person sees on a vehicle is the paint- it gets the maximum number of eyes pointed in the right direction, and keep them there longer. 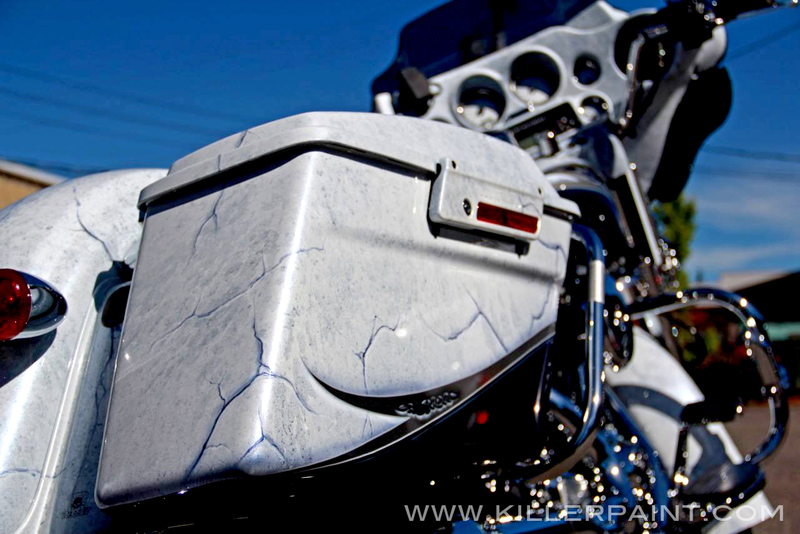 Sometimes a car or truck will feature equipment or parts that are sold, manufactured or installed by the company. 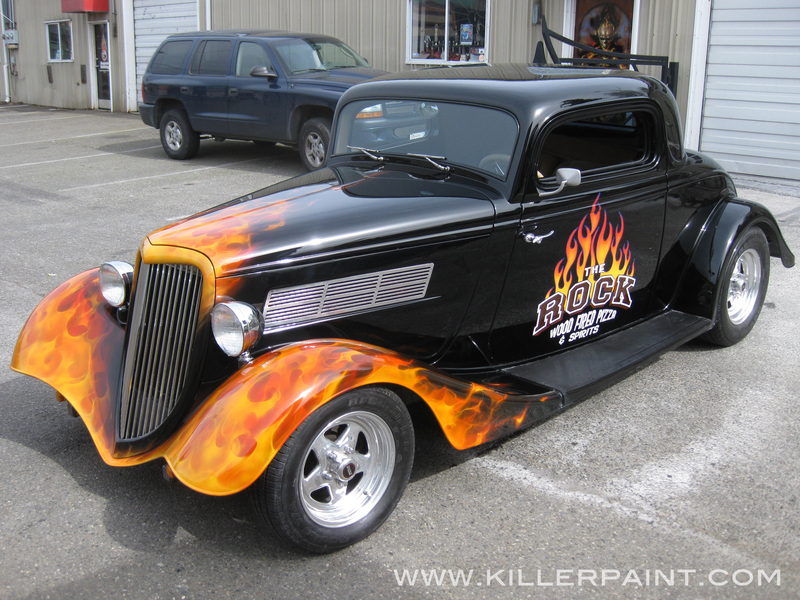 Other businesses might simply use the vehicle to draw notice by having an attention-grabbing car with their name on it. Then all that is needed is to get it out in front of people and make sure it gets seen. 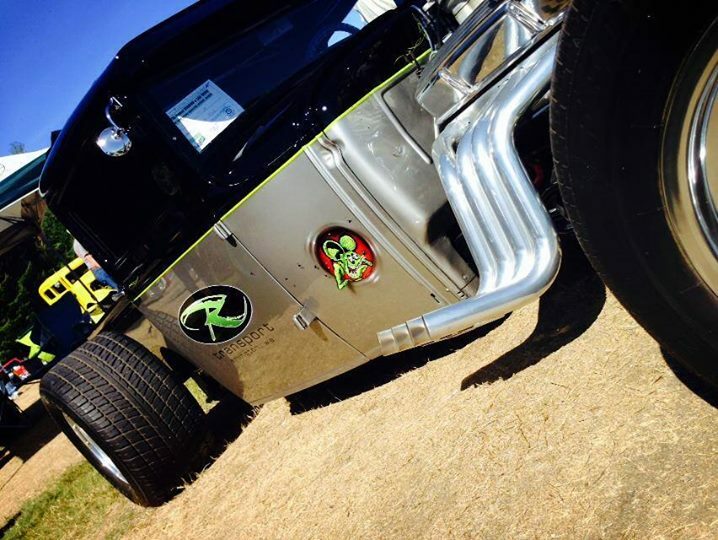 Some show cars, trucks or motorcycles will even do one or more show tours, making appearances at a number of special locations, promotional events or even charity fundraisers. 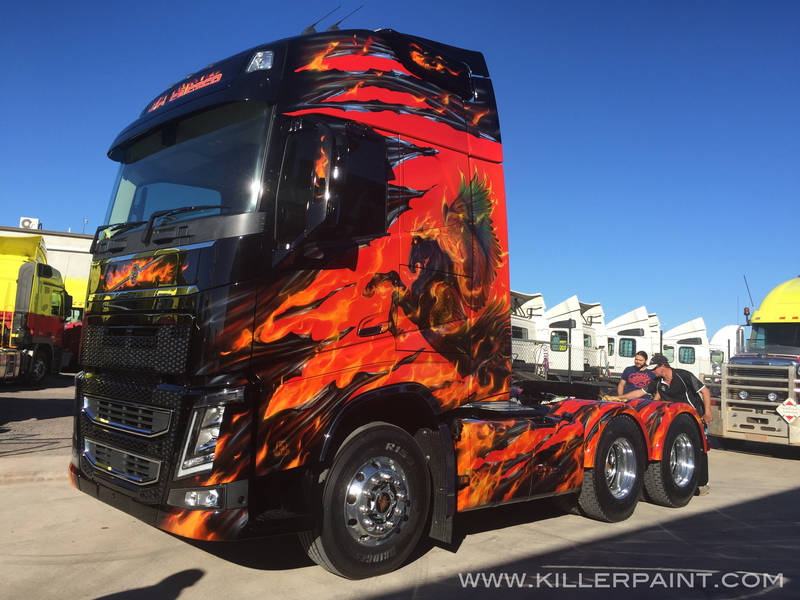 A really nicely done show vehicle can potentially continue to draw attention to the business for a number of years with the right amount of exposure. The right kind of show car could even possibly gain its own reputation and build its own fan base. The flipside of this coin is putting a private vehicle to work in order to advertise one’s business. 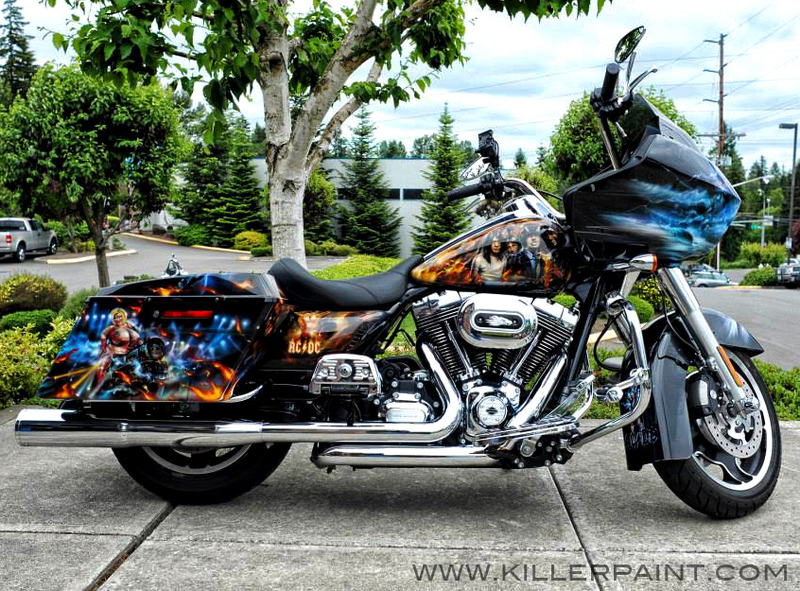 Sometimes an owner of a company will have a vehicle of their own that they want to get custom artwork painted on, and take the opportunity to draw attention to their business at the same time. 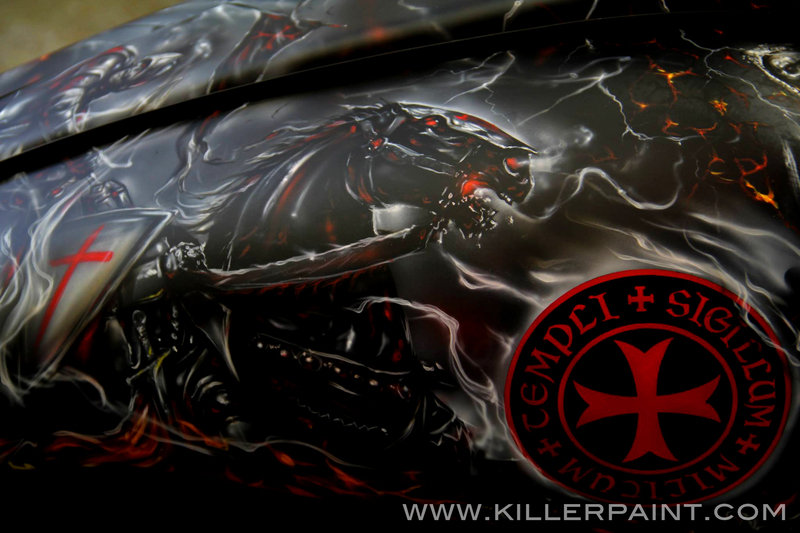 Some Killer Paint customers choose to include their company name or logo with the artwork, while they are already having their vehicle painted for their own personal enjoyment. That way, their business name goes out with them wherever they take it. 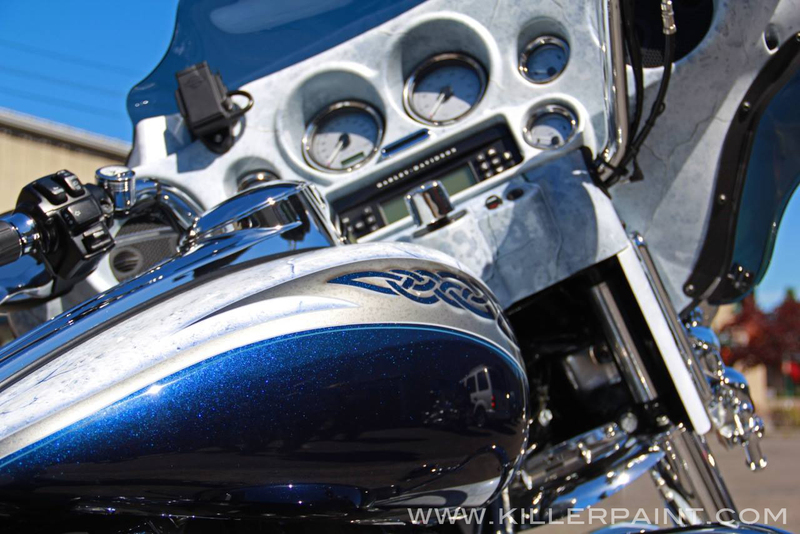 When it comes to work vehicles that see a lot of use, or might get a lot of wear and tear from heavy duty kinds of work, many businesses are reluctant to have high-quality custom paint done. 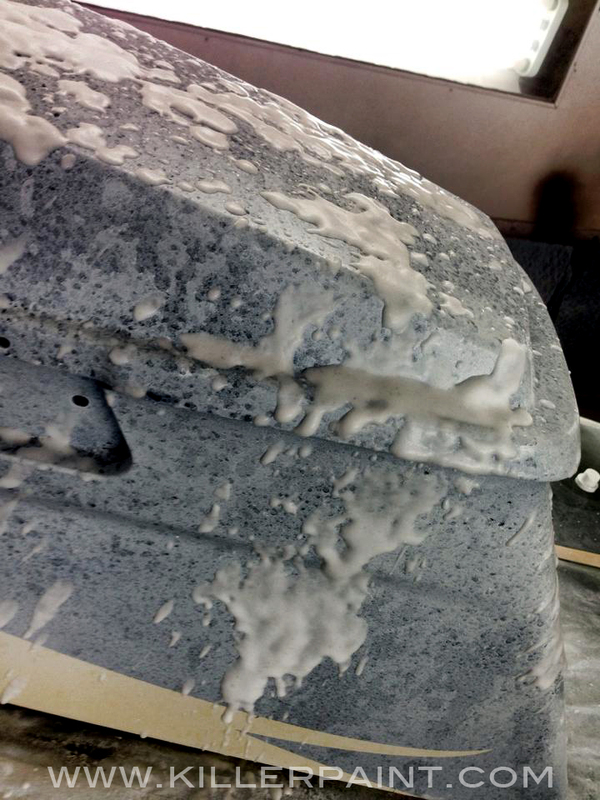 The paint on a workhorse vehicle can take a serious beating just from simply being driven often, from things like rock chips, minor scratches, door dings and other little hazards of the road. For vehicles like dump trucks, tow trucks or box vans, the amount of wear or abuse that one of these beasts is likely to endure is much greater. Some companies, especially one-man operations, might only have a single workhorse vehicle in use, and they are often very invested in it. 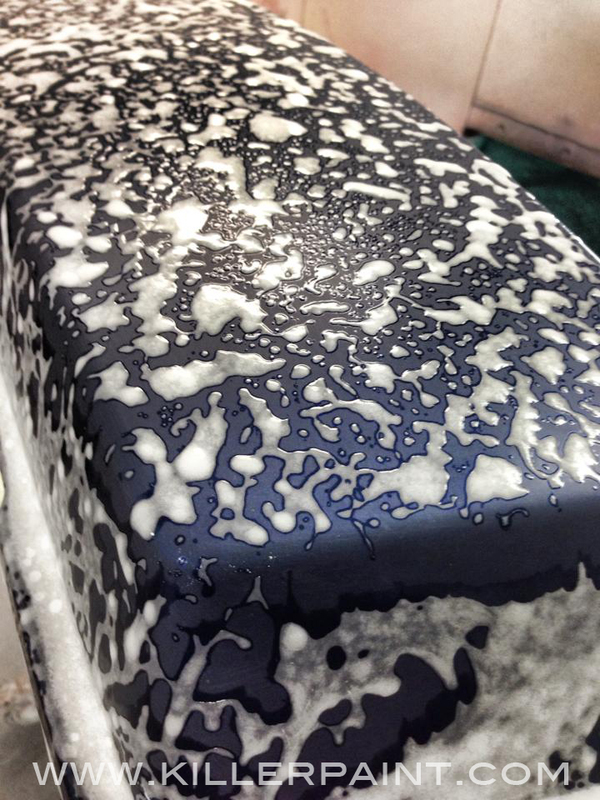 As such, they feel it is worth the effort it to make it look special, too. 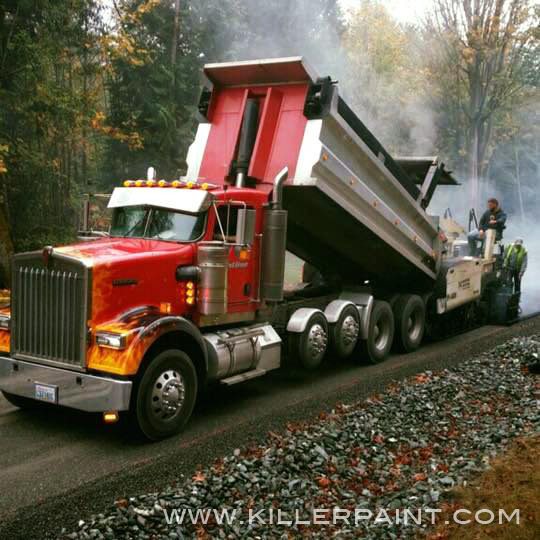 Smaller operations will usually have a smaller staff or crew, and can more easily focus responsibility on making sure proper care is taken in using a custom painted vehicle to minimize wear or damage while in use and on the job. 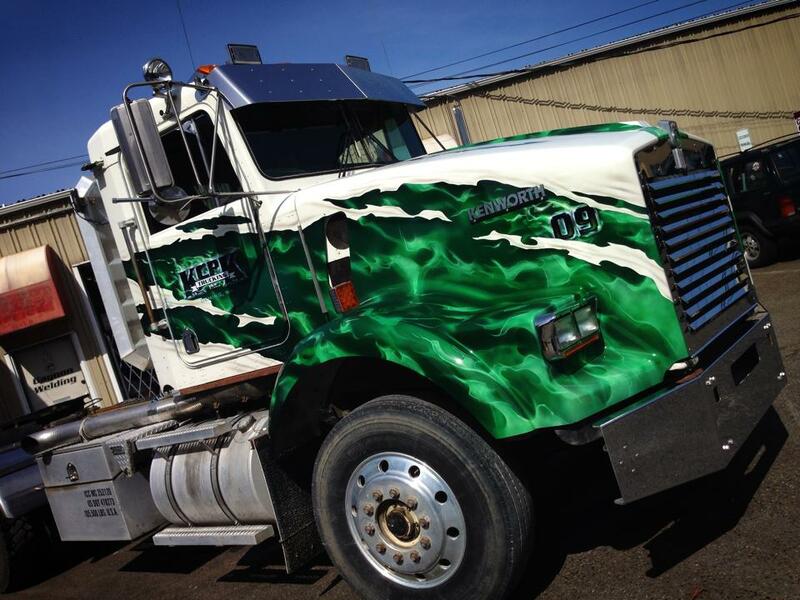 On the other hand, a business that has a larger fleet of heavy duty vehicles in use will sometimes choose to have one of their trucks receive a special paint job as a figurehead vehicle, and get custom paint for it as part of their advertising budget. Sometimes such a vehicle might be designated primarily for public appearances like parades, or parked prominently where it can be seen by a lot of passing traffic, either at the business’s main location or at an active job site. With a larger pool of vehicles in operation, it might be taken out only when needed for lighter jobs, and it can be assigned to a driver or operator that has demonstrated a high degree of responsibility in caring for equipment. 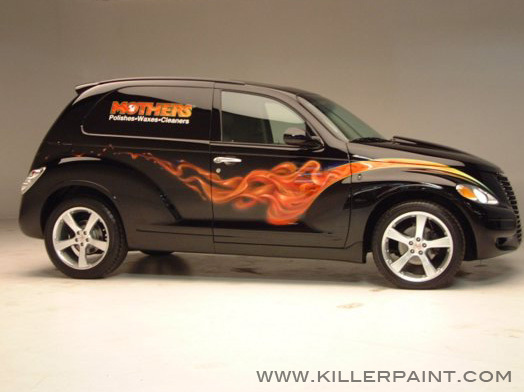 Additionally, a vehicle this eye-catching is a perfect element to feature in a company’s advertising media. Images of the car or truck can be posted on the front page of a company’s website or social media pages, as well as used in traditional print ads or even television commercials. 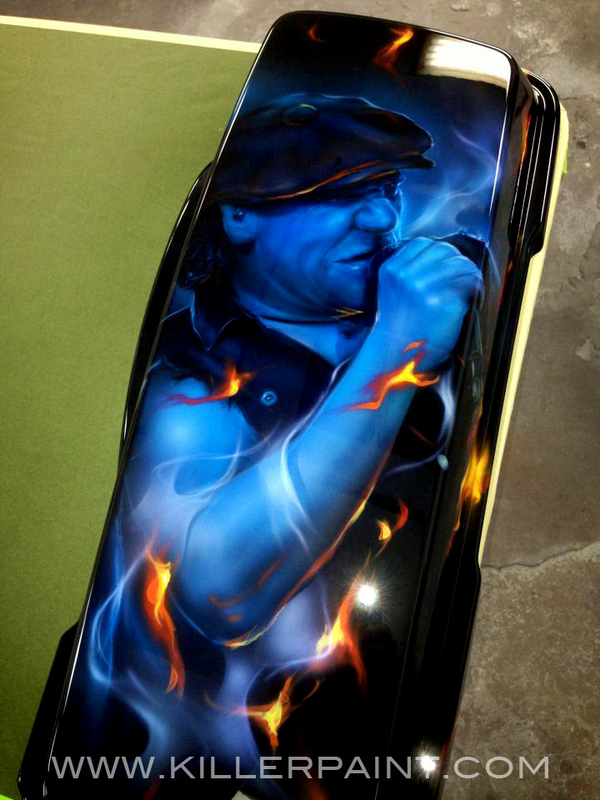 The right custom painted vehicle can act almost like a spokesperson for a company. It gets people’s attention, can make a bold statement about a business, and make people remember it. Maybe this post gave you some ideas, or you already have an idea in mind for your own car, truck, motorcycle, refrigerator, etc?